Asia is a continent home to the tallest mountain in the world, the two most populous countries in the world, and one of the world’s least accessible kingdoms. This continent is by far the world’s largest with a total area of 17,212,000 square miles, which makes up 8.7% of the Earth’s surface and 29.5% of its total land surface. Some inhabitants barely subsists in conditions of dire poverty, whereas others have lavish and extravagant lifestyles. Travelers have much to discover and experience in Asia: eating local cuisines at night markets, partying on the beaches of Southeast Asia, or traversing great distances by train on the Orient Express. Travelers also have the opportunity to connect with the spiritualism of India, by attending funeral rites on the banks of the Ganges, or witnessing the splendor of the Taj Mahal. In China, travelers can visit the extensive Great Wall, the crumbling courtyards of the Forbidden City, and Tiananmen Square, all sites of great historical and political significance. From there, travelers can travel west to visit Tibet, the spiritual home of Buddhism, or travel south to visit Taiwan, the democratic counterpart to China, or Hong Kong, a high end shopping destination with an extensive array ethnicities and subcultures. In Japan, Tokyo offers an extensive array of colorful subcultures and highly advanced technology mixed with ancient pagoda temples and delicious sushi. The empty expanses of Siberia invite intrepid explorers to live off the land. Beyond that, Central Asia is home to sparsely populated plains with nomadic cultures that have existed for centuries. Thailand also has much to offer: outdoor adventures and activities in the north, beautiful beaches and wild parties in the south. Asia is chock full of hidden – and not so hidden – gems that can be suited to fit almost any budget. Most modern languages refer to the continent of Asia by the same name. It was translated from Ancient Greek into Latin, and its spelling has remained unchanged for millennia. Given its ancient origins, it’s almost impossible to pinpoint the exact source of the name still used for the Asian continent, with competing theories suggesting it originated as a Hittite or Arkadian word for long-defunct confederations of eastern states thousands of years ago. Asian history is typically separated according to five distinct regions: East Asia, South Asia, Southeast Asia, the Middle East, and Central Asia. Some of the earliest civilizations arose in Mesopotamia, the Indus Valley, and along the Yellow River. Prehistoric sites from the Neolithic area have been identified in India, China, Lebanon, Palestine, and Syria. For instance, the Ubaid culture flourished in southern Mesopotamia from 5500 BC. Neolithic cultures were gradually replaced with the coming of the Bronze Age around 3500 BC. Some of the earliest bronze works were also developed during this period in China and Vietnam, and date back to the prehistoric Dong Son Culture of Vietnam. During this period, the Indus Valley civilization arose, mostly in the western side of the India subcontinent. This era is known as the Vedic period due to the epic hymns - Vedas - that were written during this time. These hymns became the basis for the Vedic religion, which eventually developed into Hinduism. The Vedas were written using the Sanskrit language, which also developed during this period. The Vedic period lasted from 1500 to 500 BC. In the Middle East, a massive empire dominated territory from Greece and Turkey to the Indus River and Central Asia. This empire, founded by Cyrus the Great, is known as the Achaemenid dynasty of the Persian Empire. This empire was characterized by cultural tolerance, advanced infrastructure, a highly centralized government, a tax collection system, extensive bureaucracy, and a spy system to make sure regional officials remained loyal. The Persian Empire’s primary religion during this period was an early form of monotheism, Zoroastrianism. This religion introduced the idea that spiritual salvation could be attained through an individual’s moral action, as well as the idea of heaven and hell. These concepts were important foundations for the Abrahamic religions that developed later on: Christianity, Islam, and Judaism. The brief Hellenistic Period of the Persian Empire began when it was conquered by Alexander the Great around 334 BC. However, the area remained unstable and fell apart following the death of its conqueror. Alexander’s rule was followed by short, unstable dynasties like the Seleucid Empire and the Parthian Empire. However, by 200 A.D. a major world power was growing in the form of the Sasanian Empire, which is also known as the second Persian Empire. This empire dominated the region for more than 400 years. During his reign, Alexander the Great had also reached India with the goal of conquering the entire world. However, his expansion ended in India because his army refused to march further. Shortly after, the largest and most powerful empire in ancient India was established: the Maurya Empire (321 - 185 BC). However, the territory ruled by Maurya Empire was eventually conquered by Kushan invaders from the northwest. Thus, the Kushan Empire was established, but then fell apart by 220 AD, only to be replaced by the Gupta Empire in 320 AD. This empire came to an end in 535 AD, when the area was overrun by the Huns. Classical China experienced the rise and fall of several dynasties as well: the Zhou dynasty (1046-256 BC), the Qin dynasty (221-206 BC), and the Han dynasty (206 BC - 220 CE). The Zhou dynasty relied on a feudal system to retain power, and the government was highly decentralized and weak. The Zhou claimed the Mandate of Heaven - the idea that the emperor was divinely chosen - to hold on to power. They also unified the Chinese language, and encourage the population to expand and settle in new territories. Political instability developed due to nomadic raids and internal conflict, though this instability was mitigated by the writings of Confucius and Laozi. Nonetheless, the dynasty eventually fell apart, leading to the Warring States period (402 - 201 BC). China was once again united during the Qin dynasty, during which the feudal system was replaced by bureaucracy meant to support the emperor. A uniforms tax system was established, road built, measurements standardized, borders expanded, a standard currency established, and a an official written and spoken language established. The construction of the Great Wall of China also began during this period. The emperor at this time was highly unpopular for his promotion of Legalism, which is based on the notion that people are inherently evil and need a strong, forceful government to control them. The following dynasty, the Han Dynasty is popularly hailed as the golden age of Chinese history. The Silk Road was developed during this period, which facilitated trade from China to the Persian Empire to the Romans. Confucianism also became highly popular during this period. The bureaucracy was further developed and would ultimately end up lasting for over 2,000 years. However, by 100 AD, bureaucracy had become highly corrupted and inequality worsened with violent repercussions. A period of rebellions known as the Six Dynasties began as weak rulers and dynasties attempted to establish control. The postclassical era of Asian history then began, generally between the years of 200-600 and 1200-1500. This period followed ancient history but preceded modern history. Major civilizations that arose during this time include the Han, the Western Roman Empire, the Gupta Empire, and the Sasanian Empire. This period is generally known for the frequency of invasions from Central Asia, the development of major world religions like Christianity, Islam, and Buddhism, and the development of increasingly complex networks of trade, as well as military contact between leading powers. The faith of Islam first began spreading with Muhammad’s travel from 613 to 630. His religious teachings unified the tribes of the Arabian desert into an Islamic Empire. Islamic rule was then established in the Middle Eat, Caucasus and Central Asia during the 7th century. The Islamic Caliphate and other Islamic states even eventually stretched as far as the Indian subcontinent and Malay archipelago. However, internal conflict eventually caused the division of two different sect of Islam: Sunni and Shia. Ultimately, the Sunni overcame the Shia and established the Umayyad Caliphate. The Umayyad established their capital at Damascus, in what is known today as Syria. However, by the early 8th century, the Umayyad Empire was in decline and a new empire was established: the Abbasid Empire. The capital was moved to Baghdad in Persia, an absolute monarchy was established, and more complex bureaucracy established. Eventually, however, the Umayyad Empire also fell. The Turks established a new rule with the Seljuq dynasty in 1051. During the next couple centuries, the Europeans attempted to wrest control of Islamic territory with the crusades, but lost all territory they had gained when Saladin united the Muslims in the late 12th century. The Islamic empire began to decline in the early 13th century when faced with multiple invasions from the Mongols, led by Genghis Kan. By 1401, the Islamic caliphate was greatly weakened and a new group of Turks arose to replace the previous empire: the Ottomans. Ottoman rule marked the end of the caliphate. Medieval China was characterized by the rise and decline of the Sui, Tang, Song, and Yuan dynasties, as well as a more advanced bureaucracy, increasing spread of Buddhism, and establishment of Neo-Confucianism. The Sui dynasty began in the 580s when an aristocrat named Yang Jian named himself Emperor Wen, and united the Northern Zhou Dynasty with the southern Chen Dynasty. However, his neglect of the empire and military failures ultimately led to his assassination. One of his advisors claimed the throne and established the Tang dynasty in 623. During this period, the Chinese empire expanded through conquest. Buddhism became increasingly popular. However, the neglect of a later emperor caused unrest and eventually sparked a revolt in 755. The Tang dynasty ended in 907, and the following period, known as the Five Dynasties and Ten Kingdoms period, was characterized by division and conflict. During the Song dynasty, established in 960, saw the revival of Confucianism, which granted greater power to Confucian scholars over Buddhists or aristocrats, and intensified the disempowerment of women. The practice of binding women’s feet began during this period. The Yuan Dynasty was established by the Mongol leader Kublai Khan in 1271. The Mongols tried to segregated Mongol and Chinese cultures, though Kublai himself was deeply interested in Buddhism, Taoism, and Confucianism. During this period, China had a large influence on Japanese culture. Confucianism, Buddhism, and bureaucratic practices spread from China to Japan. Medieval Japan saw the beginning of the Asuka period, during which the Yamato dynasty was established. The Ming dynasty was established in 1368, and drove out the Mongols. Irrigation systems and other public projects were supported during this period. The Ming period is also noted for its fine arts, the intensification of Neo-Confucianism, and the development of the Chinese novel. Classics such as Journey to the West were written during this period. Nonetheless, the Ming began to decline near the end of the 1500s. The government’s neglect led to famines and poverty. During the early modern period, the Russian Empire expanded into Asia, eventually controlling Siberia and most of Central Asia by the end of the 19th century. From the 16th century onwards, Anatolia, the Middle East, North Africa, and the Balkans were controlled by the Ottoman Empire. India was ruled by the Mughal Empire, which initiated a golden age for the region. The Manchu invaded China, established the Qing Dynasty in the 17th century, and secured the largest economy in the world. Trade with Westerners increased, particularly in Macau and Canton. Conflict between China and Europe erupted with the Opium War, which started because of the trade imbalances between Europe and China. Europe had a high demand for Chinese goods, but the Chinese themselves were less interested in European goods. So Europeans began to sell opium to the Chinese to change the imbalance, which led to widespread drug addition. To protect the country’s wealth, the Chinese emperor attempted to eradicate the opium problem, but this led to a declaration of war from the British. China was forced to cede to the British and open up trade with other European countries and the USA. By the early 20th century, many European countries had gained control or political advantage in much of Asia, such as British India, French Indochina, and Spanish East Indies. In 1916, the Trans-Siberian Railway was completed to facilitate travel and trade between Europe and Asia. During the Second World War, Imperial Japan spread and conquered parts of China and Southeast Asia. Japan lost this territory after losing the war, and many countries also became independent from European colonialism. The Qing dynasty eventually fell, leading to a period of civil war between the communist party and the nationalist party. The horrific Japanese invasion of 1937 led to a brief alliance, but the communists eventually drove the nationalist out of China to Taiwan, where they have remained in exile to this day. Communist rule has continued over the last century in Mainland China. Several Asian territories were used as proxies during the Cold War. The Soviet Union and People’s Republic of China solidified control over some areas, whereas others formed pacts with western allies. Conflicts between communists and anti-communists erupted in the Korean War, the Vietnam War, and the Soviet invasion of Afghanistan. Eventually, new states arose in Central Asia when the Soviet Union collapsed in 1991. Central Asia includes the countries of Afghanistan, Kazakhstan, Kyrgyzstan, Tajikistan, Turkmenistan, and Uzbekistan. This region is known for its rugged terrain, nomadic cultures, and Muslim and Turkish-speaking peoples. These countries were formerly Soviet republics, save for Afghanistan. Today, all have authoritarian, secular governments (except for Kyrgyzstan). Afghanistan used to be a popular backpacker destination, but some thirty years of conflict and famine have substantially decreased its touristic appeal. Kazakstan, sparsely populated but beautiful, is the world’s largest landlocked country. High up in the mountains, Kyrgyzstan is the easiest and most pleasant Central Asian country to visit. Off the beaten track, Tajikistan is Central Asia’s poorest country. Turkmenistan and Uzbekistan are both also beautiful, but difficult to travel through due to government and bureaucratic restrictions. East Asia includes the countries of China (including Macau and Hong Kong), Taiwan, Japan, Mongolia, North Korea, and South Korea. East Asia has made the greatest developments in infrastructure, health, education, and general standards of living over the last couple decades. China leads the charge as the largest economy in the region. China is also home to beautiful architectural marvels that have endured centuries of conflict and change. Hong Kong is a former British colony that is popular for its shopping, beaches, and food. Macau is a popular gambling destination with beautiful colonial period architecture. Taiwan is a democratic outlier of Chinese civilization and the gay capital of Asia, known for its exciting night markets, fine beaches, and beautiful mountains. North of China, Mongolia is a vast country with nomadic cultures and beautiful landscapes. Japan is one of the most modern countries in the world and has made highly unique creative contributions to the world, like Hello Kitty, Pokemon, and Nintendo. North Korea, though open to tourists, is a secluded totalitarian country with a way of life that largely hidden from outsiders. South Korea is North Korea’s democratic and capitalistic counterpart, with a popular culture that has swept across most of Asia through film, television, music, and food. The Middle East is a region that was demarcated by British colonialists in the 19th century. The area is highly ethnically mixed, with Arabs, Jews, Persians and Turks making up the largest groups. The region includes the countries of Bahrain, Iran, Iraq, Israel, Jordon, Kuwait, Lebanon, Oman, Qatar, Saudi Arabia, Syria, United Arab Emirates, Yemen, and the Palestinian Territories. Though certain areas are marked by high levels of conflict or repressive rule - Iran, Lebanon, Yemen, Syria, Iraq, Israel, and Palestine - the Middle East is still a highly popular travel destination. Saudi Arabia and the United Arab Emirates are economic powerhouses due to their vast reserves of oil. The United Arab Emirates is also a highly popular shopping destination and contains the only shopping mall in which one can go skiing. Turkey straddles the cusp of the East and the West, making it a fascinating destination with culturally diverse practices. However, one thing most of the population has in common is their adherence to Islam. The Caucasus includes the countries of Azerbaijan, Armenia, Georgia and Turkey. This area straddles the boundary between East and West, though it is generally viewed as part of modern Europe. The area is well known for beautiful alpine landscapes, including Mount Elbrus, the highest mountain peak in Europe. The area is an emerging tourist destination, but though areas like Chechnya are considered too dangerous to visit. South Asia includes the countries of Bangladesh, Bhutan, India, Tibet, the Maldives, Nepal, Pakistan, and Sri Lanka. These countries are contained between the Himalayan mountain range, the Ganga and Indus river valleys, and the Indian Ocean. Bhutan is a beautiful, high traditional country but difficult to enter to the visa restrictions meant to protect the country’s traditional cultural practices. Nepal, home to Mount Everest, is a popular adventure destination. The Maldives have beautiful beaches, though they are increasingly at risk due to rising ocean levels. India is home to over a billion people, centuries of history, delicious food, rich cultural traditions, and beautiful architectural destinations like the Taj Mahal. A little off the beaten path, Bangladesh is a friendly Islamic country, though relatively impoverished compared to its neighbor, the rapidly growing India. Sri Lanka is an island country south of India with a tropical climate, a rich cultural history, popular beach resorts, and several national parks. Pakistan lies within the overlap of Central Asia, East Asia, and South Asia. Though certain areas are off limited to foreigners or have limited infrastructure, Pakistan does drawn in travelers interested in the ancient ruins of Moenjodaro, historical shrines and mosques, or the trekking opportunities offered by the mountains of Gilgit-Balitstan. Southeast Asia includes the countries of Brunei, Cambodia, East Timor, Indonesia, Laos, Malaysia, Myanmar, the Philippines, Singapore, Thailand, and Vietnam. Brunei is a small, but rich island country with an oil-based economy. East Timor is a poor nation with abundant natural resources that has experienced heavy conflict and might not always be safe to visit. Indonesia is the world’s largest archipelago, known for its Komodo gardens, tropical forests, and extensive beaches, though infrastructure remains poor. Malaysia is a culturally diverse country with many different types of landscapes ranging from the skyscrapers of Kuala Lumpur to the jungles of Borneo. Singapore, the most economically prosperous country in Southeast Asia, is a popular business destination. The city is affluent, modern, and known for its restaurants, shopping, and vibrant night life. The Philippines is an island country with heavy Spanish influence, lovely colonial period architecture, and beautiful tropical beaches. Thailand is known for its adventure destinations in the north, and beautiful beaches and wild parties in the south. Laos is a popular backpacker destination with mountains and heritage sites. Neighboring Vietnam is also a popular backpacker destination offering beautiful landscapes and delicious food. Cambodia is still in economic recovery following decades of conflict, but is currently safe to travel to. The ruins of the ancient city of Angkor and the beaches of Sihanoukville are popular Cambodian destinations. Though Myanmar has recently begun opening up to tourism after decades of military dictatorship and conflict, ethnic violence has once again arisen in this country, making it unsafe for travel. Asia is home to a high quantity of different languages, many of which are entirely unrelated. Nonetheless, certain languages are widely spoken and can be quite useful in certain regions. For instance, classical Arabic is widely understood in the Middle East, Russian is fairly well known in Central Asia and the Caucasus, Hindi and Urdu are popularly spoken in South Asia, and Mandarin Chinese is helpful in China, Taiwan, and Singapore. Many people can also speak English in India, the Philippines, Singapore, and Hong Kong. Over the last 40 years, East Asia has had the most improvement in the Human Development Index, out of any region in the world. Asia largest airports include Tokyo, Beijing, New Delhi, Kuala Lumpur, Bangkok, Hong Kong, Mumbai, Singapore, and Dubai. If traveling from Europe, the Trans-Siberian makes for an interesting experience. However, air travel is the most likely form of transportation from country to country, due to the vast distances between regions. The quality of internal infrastructure is highly dependent on individual regions and countries. Asia has the highest purchasing power out of any continent. China, Japan, India, South Korea, and Indonesia are the largest economies within Asia. These economies, particular China and India, have been growing rapidly since the late 1990s, though China’s place as a leading economy has a long history. Japan was the largest economy in Asia for several decades in the late twentieth century, but was overtaken by China in 2010. According to Goldman Sachs, China will have the largest economy in the world by 2027. Asia’s economy is largely driven by natural resources like petroleum, forests, fish, water, rice, copper, and silver, as well as manufacturing, particularly in East and Southeast Asia. Cheap labor and developed infrastructure have attracted many American, European, Korean, and Japanese companies to Asia’s developing countries. Asia is also home to some of the world’s primary centers of finance: Tokyo, Hong Kong, Singapore, and Shanghai. India has become a major hub of the information technology industry. Call centers have become prevalent there, as well as in the Philippines, due to their large workforce of highly skilled English speakers. 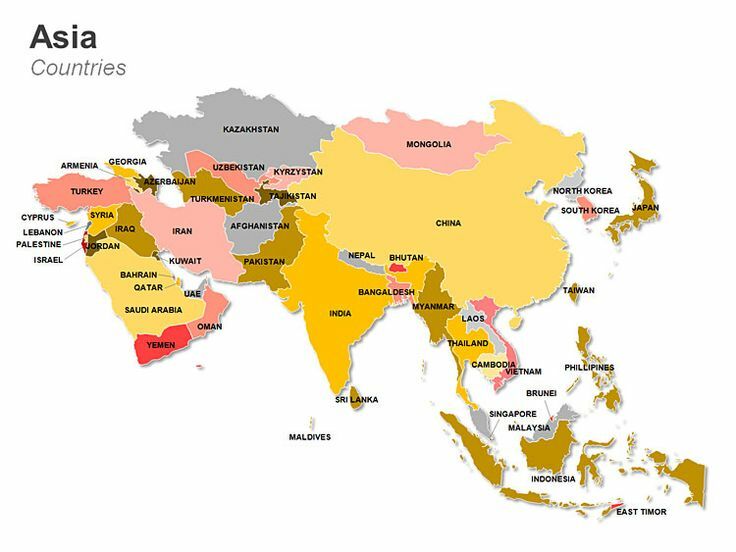 Most of Asia is safe, but a few regions do experience dangerous levels of conflict, most notably Afghanistan and Iraq. Yemen and Syria are also experiencing civil unrest making them unsafe for visitation. The Gaza Strip is essentially a war zone that should also not be visited. Israel has also experienced many missiles attacks and suicide bombings. Lebanon and Palestine also both regularly experienced internal conflict. Parts of the Caucasus are also unsafe: Chechnya, Abkhazia, and South Ossetia. Lower level conflict areas include Iran, Pakistan, Kashmir, and Northeastern India. In Southeast Asia, certain unsafe areas include East Timor, the southern Philippines, and the southern provinces of Thailand. The safest region is probably East Asia, although the border between North Korea and South Korea is dangerous, and visitors to North Korea should be highly cautious due to the potential for imprisonment for breaking any kind of arbitrary law. Visitors to Islamic countries should be sure to follow the rules of Islamic law, which can restrict certain activities like gambling or drinking, as well the clothes women are permitted to wear. See an error? Want to suggest something special? Feel free to take part in a discussion on Asia.